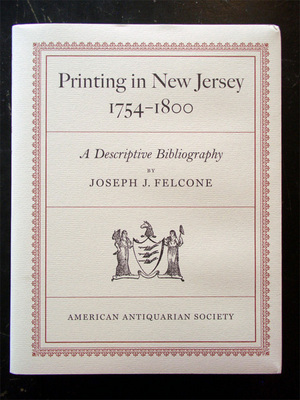 Felcone has spent a lifetime collecting, studying, and writing about New Jersey books and the early New Jersey book trade. 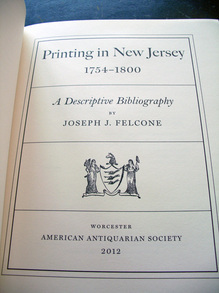 To compile this comprehensive work, he visited and fully surveyed 115 libraries—from the major repositories in the United States and England to county and local historical societies in New Jersey—and physically examined and recorded every eighteenth-century New Jersey imprint. 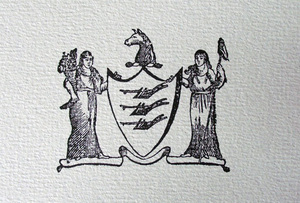 Handsomely designed by Jerry Kelly, the book is important to those working in early American printing, publishing, bookselling, book distribution and ownership, as well as related bookmaking arts such as papermaking and bookbinding. Note, for instance, the number of eighteenth-century references to Nassau Hall alone and you understand our enthusiasm with this volume. 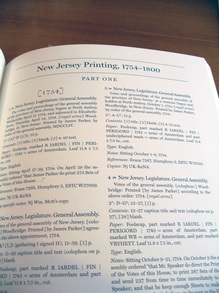 The Society of Colonial Wars in the State of New Jersey should be commended for helping to subsidized the production of the book, allowing me as a reader to acquire it for a very reasonable price. In this day and age, it is a great thrill to hold new scholarship in my hand and place it on our shelves for others to use and enjoy.